We like cricketer Kevin Pietersen and we like footballer Jack Wilshere. But who's best? There's only one way to find out - fight. Or at least Twitter spat, provoked by the Arsenal midfielder's assertion that only English players should represent their country. For some reason Pietersen, born in South Africa, took exception to this viewpoint. He pointed out that Wilshere's criteria would also exclude Olympic double gold-medallist Mo Farah, who was born in Somalia, and Tour De France winner Chris Froome, born in Kenya. "Interested to know how you define foreigner?" 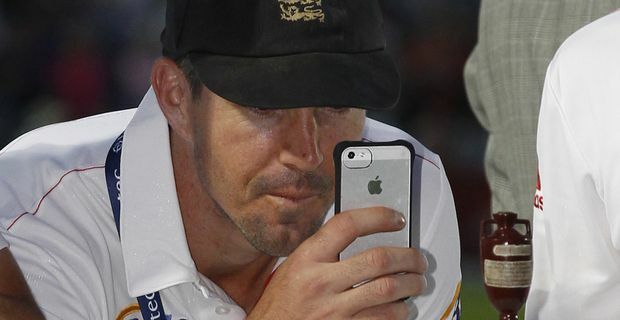 Pietersen tweeted. "Would that include me, Strauss, Trott, Prior, Justin Rose, Froome, Mo Farah?" Wilshere, who had made the remarks in response to a question about the Belgian-born son of Kosovan refugees Adnan Januzaj potentially playing for England, replied: "With all due respect Mr Pietersen, the question was about football! Cricket, cycling, athletics is not my field." There is a certain logic in this. British countries in the past have been prepared to accept parentage as qualification for a national football team, but not naturalisation. The batsman was not to be placated, "Same difference," he responded. "It's about representing your country! IN ANY SPORT!" Rather than get into a lengthy spat with one of English sport's more combative characters, Wilshere tried to be diplomatic. "To be clear, never said 'born in England' – I said English people should play for England," Wilshere tweeted. "Great respect for people like KP, Mo Farah and Wilf Zaha – they make the country proud." His club manager Arsene Wenger backed up Wilshere's opinion "I agree with him. I always said also an Englishman should manage the England team. If we are not clear on that the national teams will become like a club." Wilshere could have phrased it better though. England will hope Wilshere's touch is a little more assured on the football field than it is on social media.